With our labeled Moonwalk Straps, you don't have to deliver the wrong inflatable again. Don't get confused about which bounce house is which. 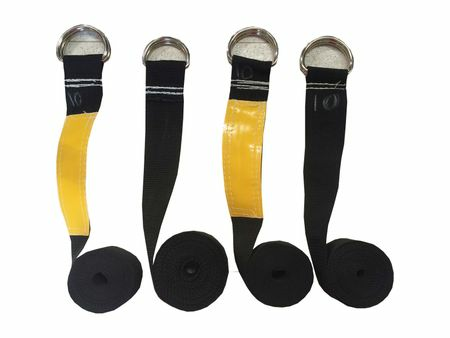 Simply write the name of the bounce house on the label and strap the moonwalk with these straps. This includes straps for two inflatables with label label for each set. Our premium straps are made of heavyweight black polypropylene webbing. They are solid black throughout with no indicator lines or markings. The straps have a 1600 lb breaking strength and a working load limit of 533 lb.